Come and visit our Pittsburgh vapor tasting bar where you can sample our high quality e-Liquid while enjoying an upscale and trendy environment. We manufacture our own products in our clean fully automated lab which ensures the safest, premium quality eLiquid on the market today. 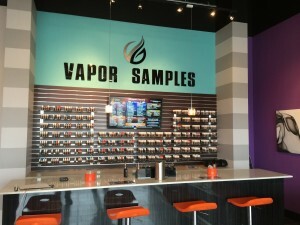 One of the things that makes Vapor Galleria special is the variety of 100 plus flavors available and the option to try the flavors out in our local vapor store. We are different from other vape shops because they only have a small variety of eJuice and minimal samples for taste testing. With 100 plus flavors, there is an e-juice flavor for just about every taste out there. Our lab created flavors range from fruity to bakery, like Strawberry Kiwi to Apple Krisp and various tobacco flavors. Customers can choose to mix flavors as well if they choose. Come in today and enjoy our clean and friendly tasting bar and vape lounge.